I always find whenever there's a big automotive related event, its parking lot is just as interesting as the actual event. I find this true with various Formula D events, like Irwindale and Atlanta, and also Tokyo Auto Salon. 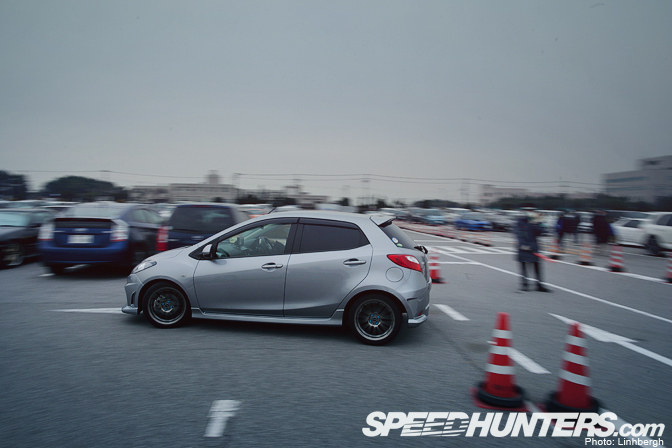 As we close off the month, here's one last look at the Tokyo Auto Salon parking lot. 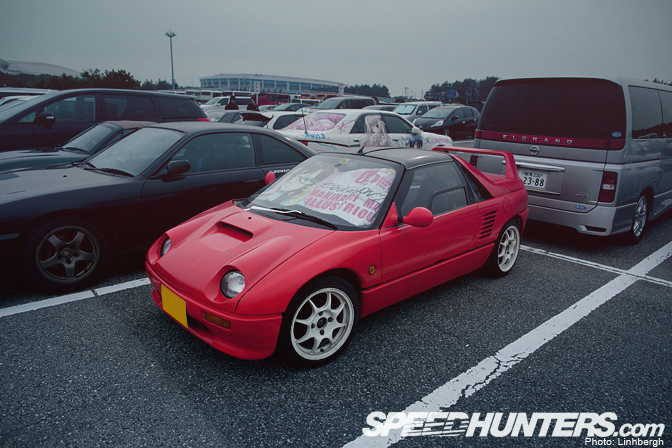 … or my personal favorite of all kei cars, the Autozam AZ-1. 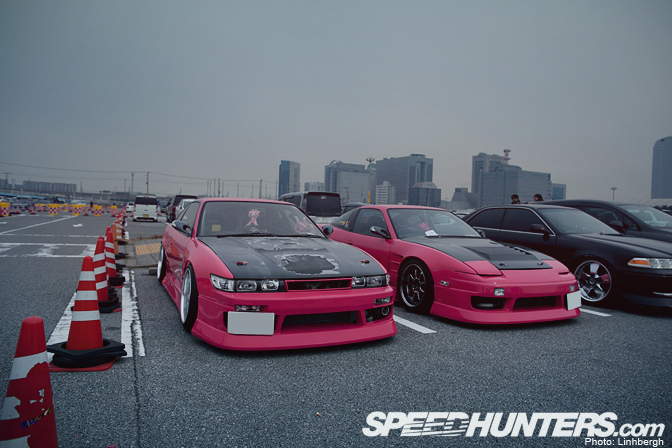 In the last look at the TAS parking lot, I posted a photo of these two pink S13s from the rear. Here's another shot. 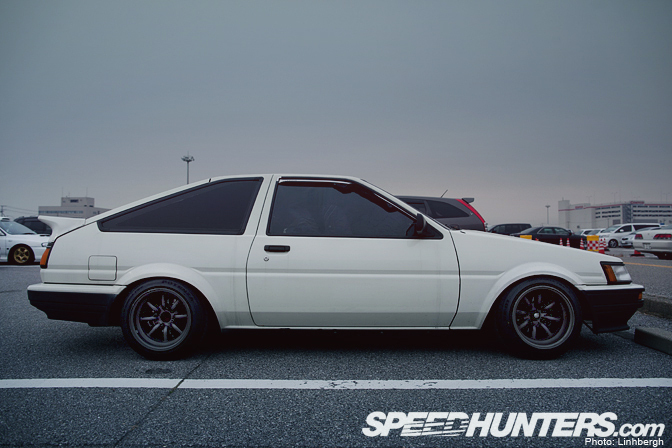 You can't really go wrong with an AE86 Corolla with a set of Watanabes. It's the classic look. You never realized just now big these newer Toyota Crowns are until you see someone standing near it. I approached the parking lot as methodically as I can. I walked down each and every isle not to miss any cars, like this D1GP R-Magic FD3S replica. But as dug deeper into the parking lot, I found myself walking to each car I found interesting, even if it was in a different aisle… or two. Here's another interesting FD RX-7 I came across sporting its super unique bodykit. I am totally loving the cream color. And here's a view from the back. Here's a clean looking BMW 6 series on air. 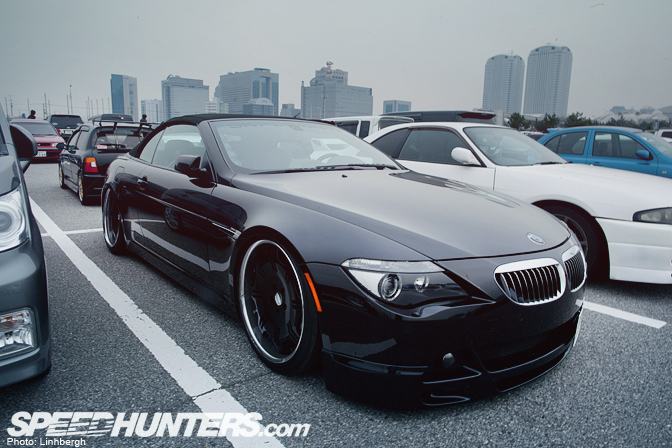 I'm not a big fan of these BMWs, but this one, completely laid out as it is, looks good. Near the 6 series above was this rather cute looking Honda Jazz. This sixth generation Toyota Mark II on a set of Long Champs was rather hidden in between two SUVs. What both Dino and I found strange was that there was a big lack of Mitsubishi Evos present at this year's Tokyo Auto Salon. The new GTR seems to have taken the attention of all the major tuners in the country. I also found this true in the parking lot. This was the only Evo I came across during my three hour excursion around the lot. Though, there seemed to be no shortage of Skylines both inside the convention hall and outside, like this R34 sporting a Speedhunters sticker. 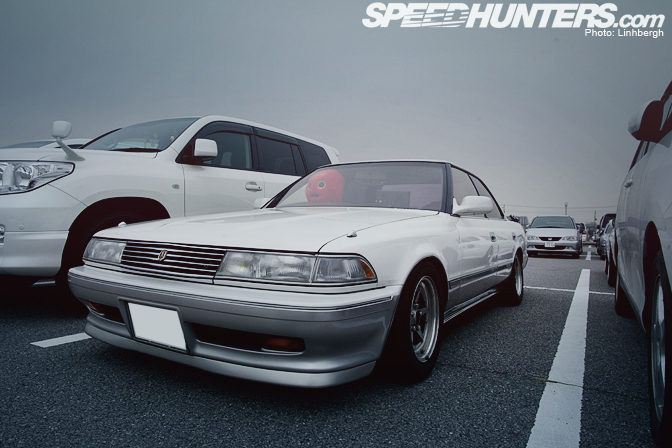 Dino seems to be doing a good job spreading the word of Speedhunters around Japan. Another Skyline, this time an R33 exiting the lot. Thumbs up, buddy! S-Chassis were also all over the parking lot. 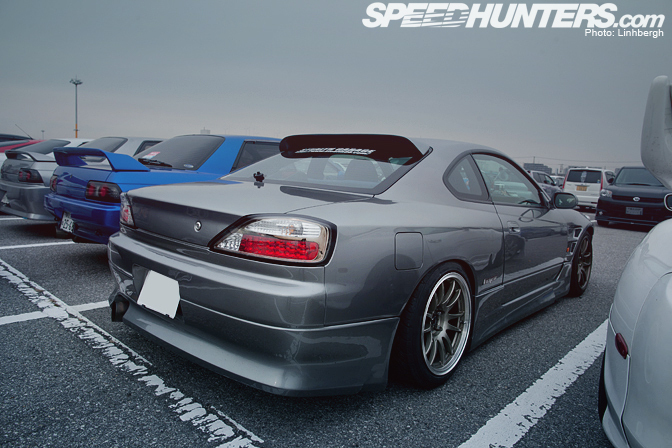 I took a keen liking to this tastefully modded S15. 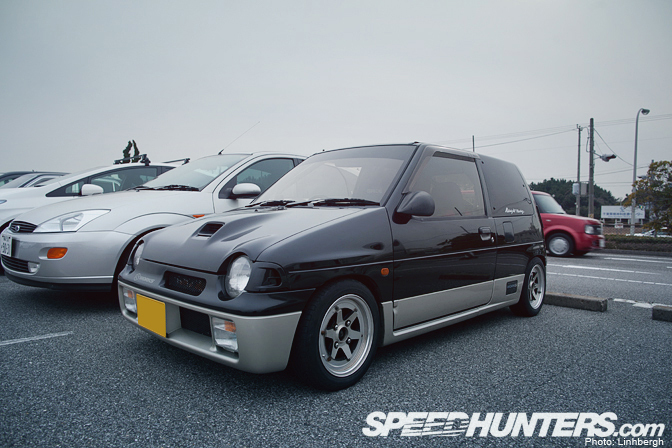 Front wheel drive or not, these Daihatsu Copens are seriously awesome –sixty-four horse powers of fury. 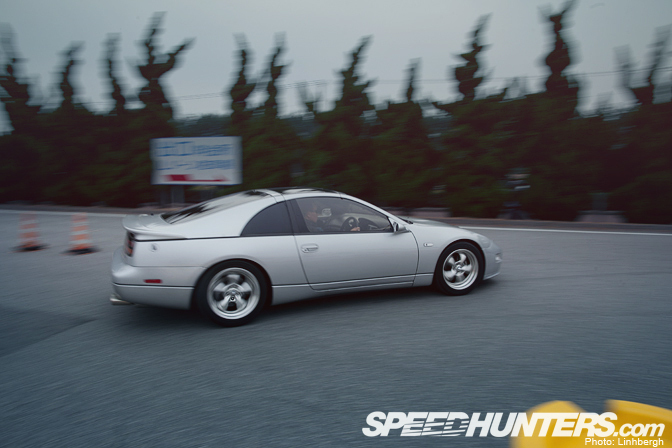 Here's a clean looking Fairlady Z32. I've never seen a Toyota Alphard before this moment. A pretty cool looking van I'd have to say. 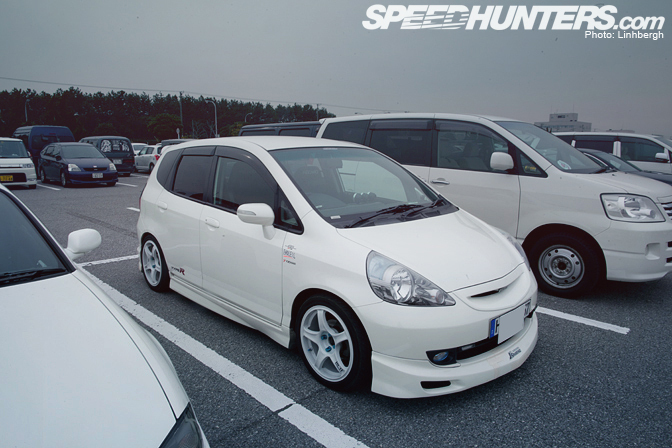 Though, not as cool as the Japanese Honda Odyessy…. Another van I've never seen before, a Toyota Wish. The lot wasn't just filled with automobiles tuned to the low persuasion. 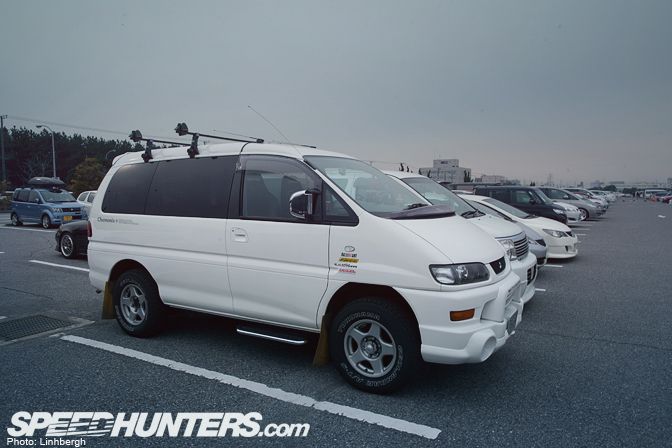 There were a few outliers, like this zombie apocalypse prepared Mitsubishi Delica. This Y33 Nissan Cima has some wild fitment going on in the rear as well as some insanely huge exhaust tips. Sticking out like a sore thumb against the grey skies and parking lot filled with white, black, and silver cars was this orange JZX100. Interesting to say the least…. Honda Odyessy's seem to be very popular cars to modify as they were littered all over the lot. I don't blame the Japanese. 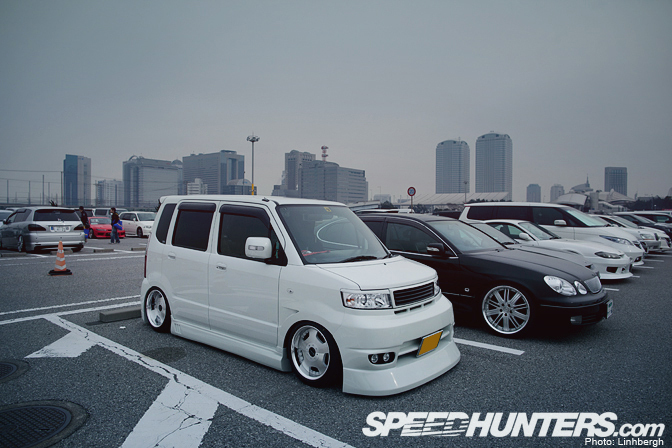 These minivans look great lowered and are super practical. This Odyessy owner really wanted to show off their van by double parking. It's amazing that people drive around this low. 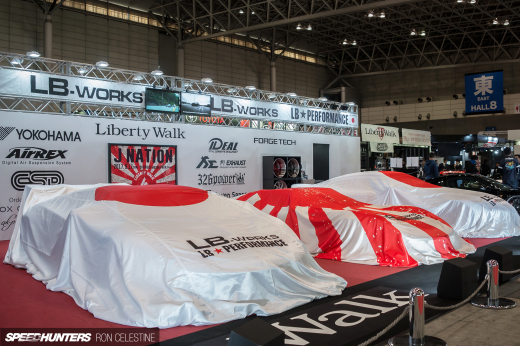 I wonder how the ride quality on these cars are at that ride height…. Here's a strange mix of different car cultures, an older Crown with a set of BBS LMs. That's something you don't see everyday. 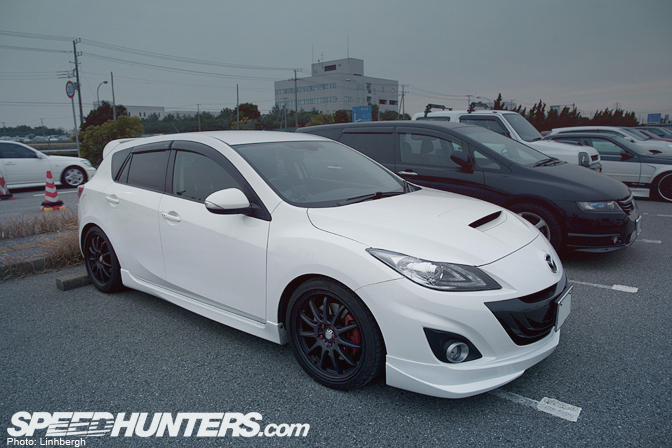 A pretty cool looking Mazdaspeed 3. There were a few Mazda Roadsters around the lot, but this Sunburst Yellow on CE28Ns was one of the better examples. 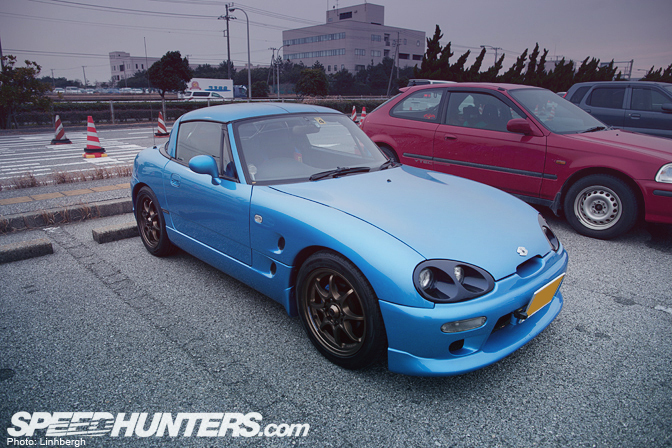 How can you not like a Suzuki Cappuccino? Especially a blue one on bronze CE28Ns? A drift spec second generation Toyota Soarer. I have no idea what is the meaning behind the "cream soda" sticker, but the fact that its a sticker that says "cream soda" quite amazing. Of course, the lot wasn't just filled with tuned cars. 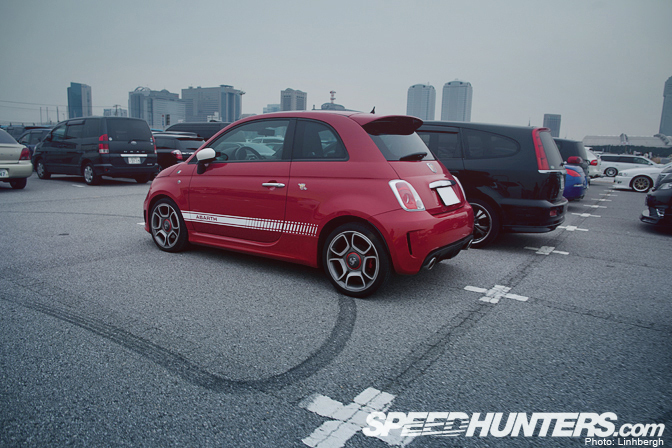 This Fiat 500 Abarth was one of the few very cool stock cars in the parking lot. …but as I came closer, I couldn't ignore the amount of D.A.D. 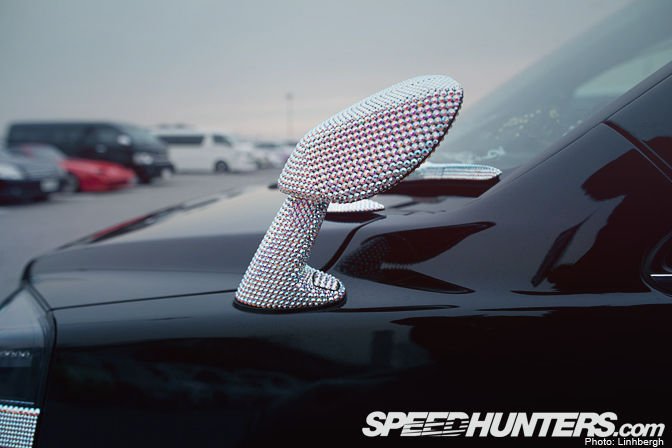 bling all over it. 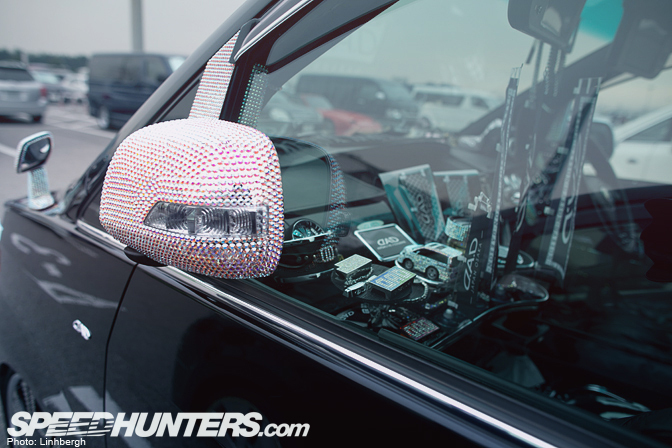 Even the side view mirrors have been encrusted with bling. The owners seemed that one pair of side view mirrors wasn't enough so a second pair mounted on the front fender was needed. 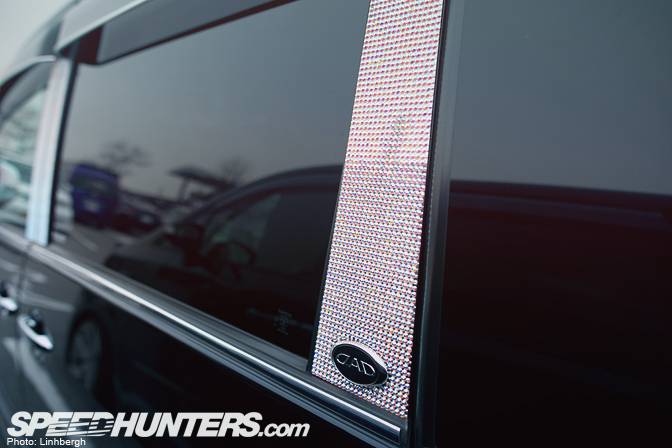 Even the front and rear windshield wiper stalks were blinged out! Amazing…. I am just now starting to see these Mazda 2s around streets of Los Angeles. But Japan has had them for a while now and it seems that people are taking a liking to them and tuning them. This silver Mazda 2 has some fairly light mods, but those mods make it look great. In the sea of Japanese cars, this lowrider Cadillac DeVille was quite a stand out. 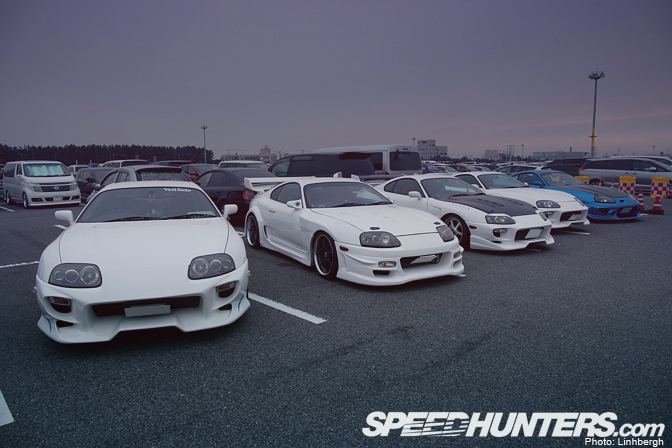 Check out these Supra guys showing off! I even like this pink Cima! Tokyo Auto Salon is a great show. 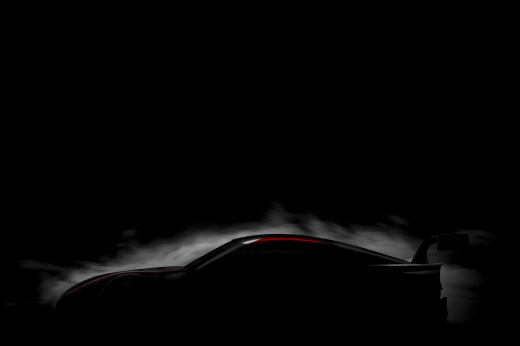 It's a trend forecast for the year and a great way to get close to many amazing cars. But to me, the real show lies in the parking lot. It's where you can see where all the hard work of the tuning shops go, as well as exactly what the Japanese populous is into. If I am fortunate enough to be back in Japan next year for TAS, you can find me scouring the parking lot all three days. 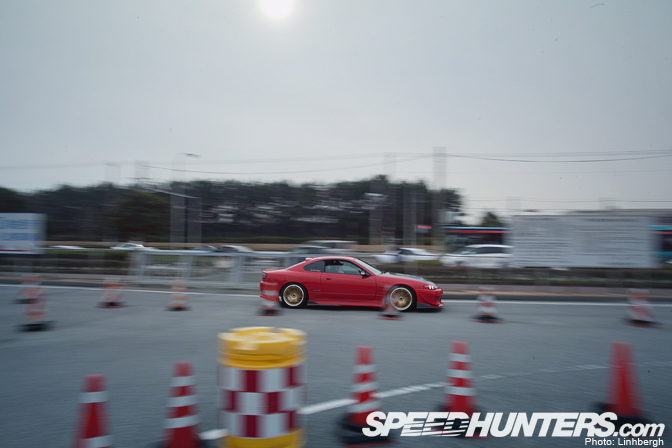 THAT RED SOARER. OH MAN. Those Cimas are gorgeous...but the black R34 Skyrine is just killing it. So good. Any chance at a desktop? This is so true for the biggest show in sweden aswell. Everyone wants to go there, but as soon as your there you always regret that you didnt stick around on the parking lot instead. Thats where the real show is. The orange JZX100 comes from Germany ?? Nice collection of cars pictures i love it all cars amazing. Autozam AZ-1 FTW!! Great fun to drive in GT5, drifting all over the place on comfort tyres lol. The noise is horrible though (in GT5, haven't really heard them a lot on youtube or something, definitely not IRL), sounds like a pencil sharpener on steriods, but they're just really fun cars those. Just like the Cappucino. 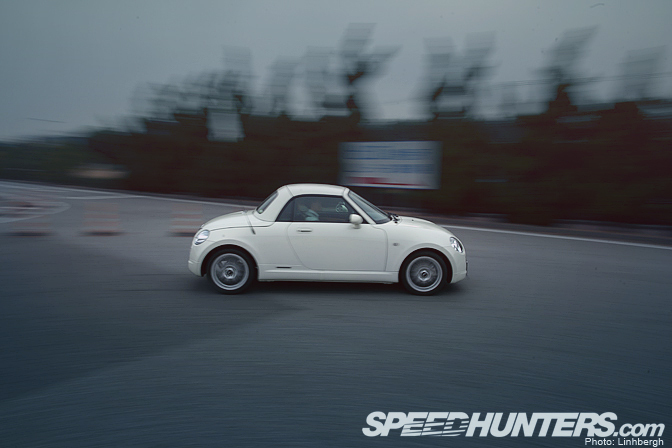 Super lightweight and RWD. The pictures do the talk..haha.. It was just truly amazing cars out there in Japan..God,I love Japan! 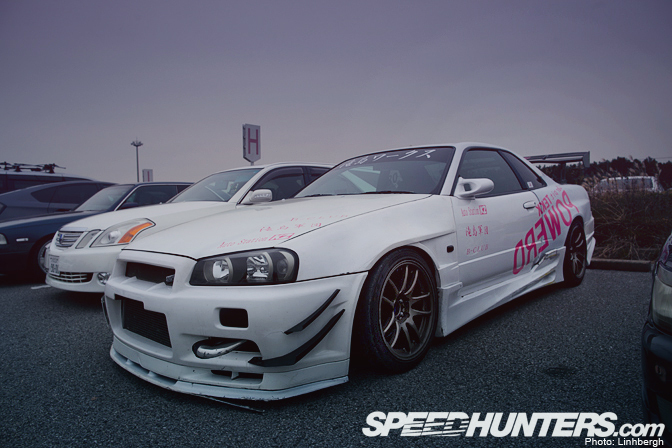 LM GT4s on the silver, speedhunters sticker-sporting R34 look absolutely amazing. You know the Fit is still called a Fit in Japan right? Not sure why you keep calling it a Jazz. That black on black Honda Odyssey and AE86 are my favorites. What rims does the 2nd RX7 have? They look fabulous on that FD3S! Autozam AZ-1... Definitely my favorite car to own! Those Supras... I just had a crisis! Thats actually a Cadillac Fleetwood Brougham, used to have one as a daily while my DC2 was being built. so much to like.. not really feeling the rear wheel cover on the FD RX-7, but the colour looks very cool! im totally sold on the odysseys. 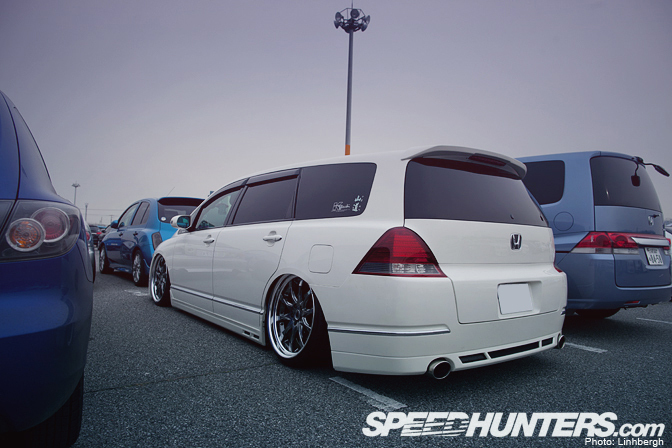 not my first choice of a car but my god would you be the coolest soccer mom ever. 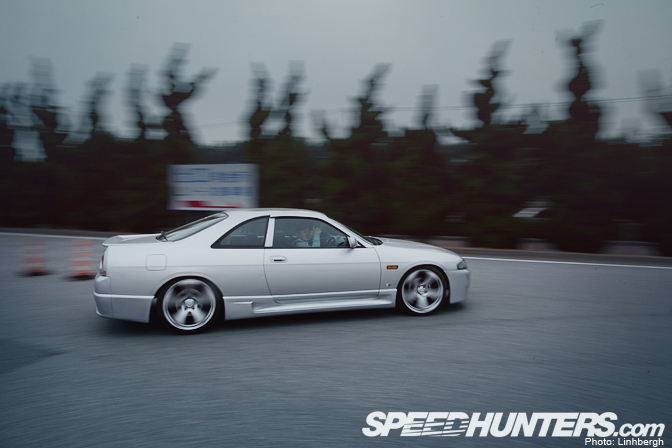 That gray S15 is so beautiful. It makes me sad that I can't get one here in the states. the sticker under "cream soda" says tochigi and in the middle it says soul. tochigi tamashii. its where nikko circuit is and i recently came back to japan to visit my dad in tochigi and the car scene here is way more exciting than it is in the u.s.! That white fd has the scoot body kit. Cool stuff! I can;t imagine driving and docking that barge...uh...Cadillac here in America, much less Japan! The car park seems more interesting then the actuall Auto Salon Hah! ^^ Win and Desktop Please! I believe the "Cream Soda" on the S15 rear windscreen is making fun of "Coca Cola" as it has a similar style of font / type. 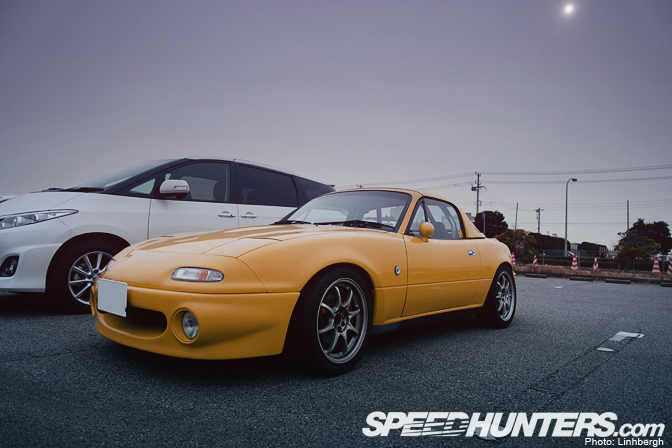 it's interesting that you would find these kinds of cars in the parking lot in japan. over here in the states it would be at meets or shows that you see something like this. 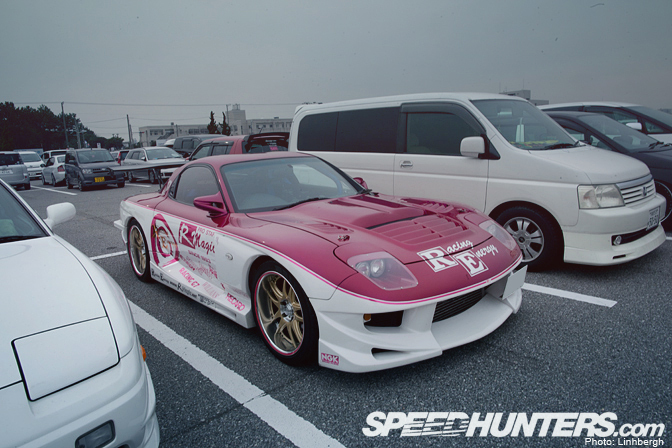 That RX-7 would look so much better with out the stuff over the back wheels. ID of the rear wheels on the grey s-chassis? Thanks! @Joey C, those are BLITZ BRW Wheels...the same as Nomuksn's BLITZ D1 ER34 used. 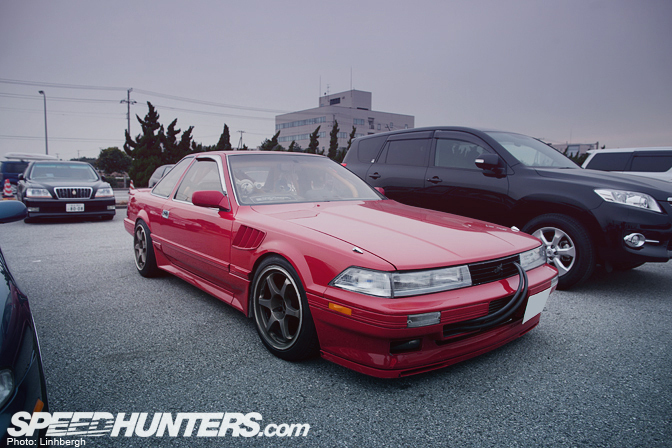 I actually have a fantasy Soarer Z20 in my mind that looks similar to that red one in the parking lot. My dream came true half-way. That RX7 is looking hella crazy. 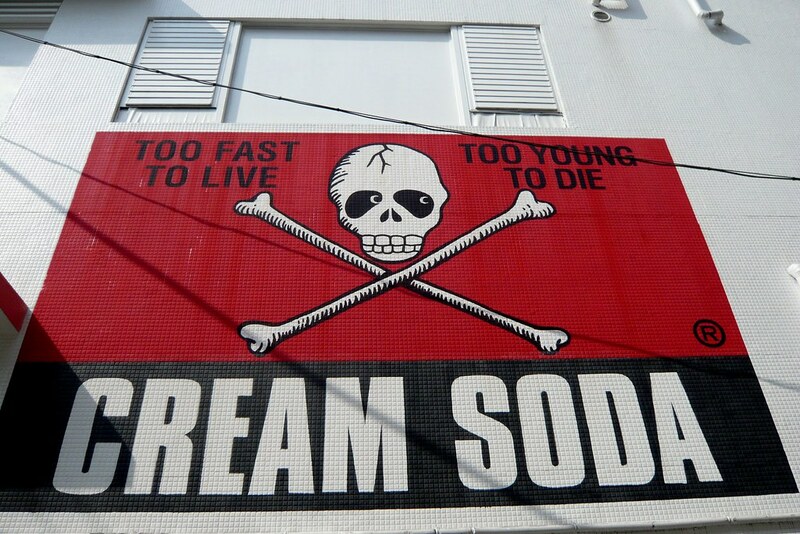 Cream soda, too fast to live too young to die. Go there! some great clothes and an awesome looking store. I stumbled on this place on my first trip to japan, and went back on my second. They have some strange military collectables and pins and such. Pretty cool, the parking lot is a show within itself. 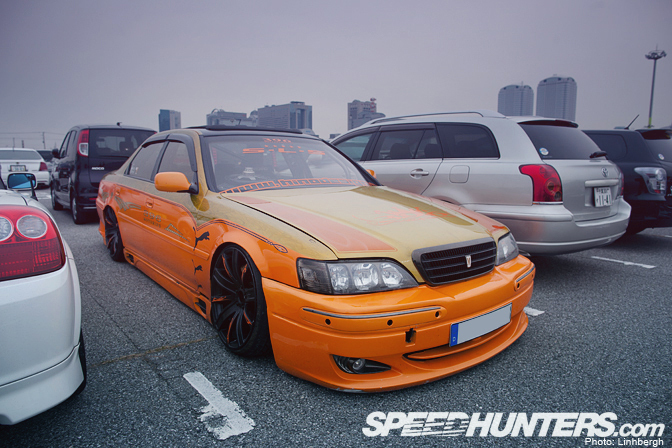 The orange JZX and the white Cima above it ... can someone call the taste police?